Let’s say you’re standing at 1 City Hall Square in Boston. You are exactly 3,223.2 miles away from where Will Burnett was born on October 23, 1998 in the John Radcliffe Hospital near Oxford, England. Just two years later he boarded a plane with his mother and father and moved to Boston, Massachusetts–and there he stayed. Growing up in the town of West Roxbury, Will often found himself looking out the window of his mother’s green Toyota Sienna minivan at men and women standing around the rotary near his home. They held signs in their hands and waved at passersby. They were friendly, inviting, but more importantly, enthusiastic. He would often wonder just exactly what they were doing, and why they would get up at 7 in the morning to stand around the Holy Name rotary. Now, he recognizes that those were people campaigning for city officials. Those were the people of West Roxbury who were visibly showing the amount they cared for their locality – he couldn’t wait to one day join in. After around 14 or 15 years of driving by those campaigners, and only around 8 years of understanding exactly what they were doing, Will ran his first statewide campaign at the 62nd Massachusetts Junior Classical League Convention. Flyers plastered on the walls, campaign candy scattered around the convention center, and pamphlets in hand, Will not only ran, but won his first campaign. Although his beginnings were small, that campaign was hopefully the first of many. It inspired him to bring together his love of graphic design, public service, and competition. Just a year later, Will found himself at the front of an AP US Government and Politics class. It turned out that the government, and the world of public service, was much more complex than he thought. Courtroom procedures were not those of Law and Order SVU, campaigns were not that of Fitzgerald Grant, and the different branches of government were more intertwined than he ever could have thought. But that made it all the more intriguing. That made him want to explore that world further through the John William Ward Fellowship. The opportunity to find himself at a desk in the State House, City Hall, or one of the many municipal buildings in Boston was too invaluable to pass up. Although he can never run for the office of President one day (don’t worry, he’s upset too), Will has dreams of finding a place in public service. After exploring the profession of law through the Boston Latin School Mock Trial team, his love of art and public relations at Artists for Humanity, and the world urban planning at Toole Design Group LLC, Will has found himself a job that he could stay in forever – as an intern in City Hall. Working for City Council President Michelle Wu has been the start of a hopefully long, and successful career in the public sector. Sitting in on city council hearings, reading through articles in the news every morning to report back to the Director of Communications, and getting acquainted with the constituents and organizations of his home of 16 years, Will has found his spot overlooking City Hall plaza. He couldn’t be more thankful. 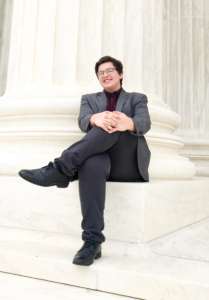 After his summer with the Ward Fellowship, Will is going to be at Boston University next fall, exploring an education in Communications, the Liberal Arts, and hopefully Political Science.